It's interesting that this category would come up this week and in light of this article about the current series of Doctor Who. It cast my mind back to a point in time in the late 80's. I'd just seen season 25 and felt like it had finally got the show back onto solid footing with two instant classics "Remembrance of the Daleks" and "Greatest Show in the Galaxy." I even liked "The Happiness Patrol" and "Silver Nemesis" on first viewing (both have dropped sharply in my estimation since that time). So, when I heard news that season 26 would feature the writer of "Remembrance" along with a new story by the guy who wrote "Dragonfire" I was pretty stoked for what had to be the greatest season in all of Doctor Who history. Finally, Maryland Public Television got the rights to air the stories and showed the entire season over two successive Saturday nights. I recorded them, eager for some new favorites and instant classics. However, my initial disappointment soon turned to enjoyment as I went back and revisited the stories and a season as a whole. Since that time, I'd say that season 26 has jumped into my top three or four seasons of the entire series run. It's a short one, but it's got some ambitious stories and some solid work done. It has an arc of sorts and it ties the McCoy years together in an interesting way. It sees the Doctor at his darkest and most manipulative, but it's also balanced by a reunion with the Brigadier. In case you've missed it, the cicada are back. It's not even June yet and I'm already tired of the bugs dive-bombing me while jogging and splattering all over my car. The other night at the library, I noticed a family collecting the little bugs and putting them into plastic bags. I was curious as to why they'd collect them and it appears I may have an answer. Apparently, there are some people who enjoy eating the bugs. There's a whole article about it in this morning's Tennessean and a Nashville couple has even created a YouTube video in which they detail the capture, cooking and eating of a cicada. The article gives tips on eating them, including when to harvest the creatures and the preparations one should make before you eat one. All I can say is the YouTube video seems to involve a healthy amount of tequila being consumed before said cicada is sauteed and eaten. I have to admit that'd be the only way I'd probably eat one. I guess I'm not an adventurous enough eater! Over the close to 50 year run of Doctor Who, there have been a lot of variations on the classic theme song. And while I enjoy all of them, there's still one in my mind that stands out above them all. It's the opening theme and titles from the Tom Baker era. Today's question is a difficult choice--which missing episode would I most like found. For years, I probably would have said "Tenth Planet, 4" is only for the historic significance of it in the Doctor Who canon. Or I could cheat and say "Evil of the Daleks, 1 and 3-7." Or "Power of the Daleks 1-6." It's so hard to choose. I keep holding out hope we may see one or all of the lost episodes restored to the BBC archives one day. I won't get into my conspiracy theory about the lost stories here.....it'd make me look like an obsessed Doctor Who fan. One of the advantages of finding Doctor Who in the pre-Internet age was that I was able to see most of the stories in isolation. I was able to see them and decide whether I liked them without the biases of the other fans on-line or even in my immediate sphere of influence. And while many of top stories are among those considered to be the "classics" of the show's run, there are still a handful that I think are overlooked or underrated when the lists of good Doctor Who stories are made. One of those is the six-part Jon Pertwee story, "The Mind of Evil." It's the second story from season eight and it features just about everything that makes the Pertwee era memorable. "The Mind of Evil" starts off with three separate story threads and slowly weaves them all together. UNIT is providing security for a world peace conference and escorting a missile full of nerve gas across the English countryside, the Doctor and Jo go to a prison to see the latest development in the rehabilitation of prisoners and the Master is on the loose. If it seems like there's a lot going on, there is, but it quickly becomes apparent that everything is connected. And by connected, I mean that all roads lead to the Master hatching some elaborate plot that involves an alien parasite the feeds on the evil in the minds of people, a prison riot, the peace conference and the missile of nerve gas. Many people point out "The Daemons" as the definitive example of the Pertwee era. And while I really like that story, I believe "Mind of Evil" has just as many of the elements of the era on display and could be at least considered in the same pantheon as the much-lauded "Daemons." Of course, it's not helped by the fact that "Mind of Evil" is only available in black and white, except for two short clips. But in this case, I think "Evil" may work better in black and white. Something about it in black and white just works. I know the Restoration Team is working their magic on it to restore the color for the DVD release and if that happens, I'll be the first in line to pick it up. But I still wonder if color may not change how I see the story. Last year when Steven Moffat took over as producer and show runner for Doctor Who, the buzz was all about seeing what a full season under his guidance might look like. Most fans agree that Moffat delivered solid results in his first season at the helm and that just amped up the curiosity to if and how Moffat might top himself in his second season as showrunner. Five episodes into the season, we've had one instant classic and a couple of stories that had some potential but maybe came up a bit short. * Of the swings and misses, this week's story was the biggest, if only because it's the first half of a two-part story and it carries a heavy load of exposition and the fact that it felt like a greatest hits compilation of lot of what we saw last year. *I'm not ready to hit any kind of panic button on the season yet, but I am concerned. It also helps to recall that I liked most of how Russell T. Davies structured his first season as show runner and then how it slowly became a law of diminishing returns during the David Tennant era. "The Rebel Flesh" has some interesting moments to it, but they're all a bit isolated. The Doctor, Rory and Amy ride a solar wave to a remote island in the near future. The island hosts a team of people who are harvesting and pumping back to the mainland a highly corrosive acid. To minimize the risk to the workers, the team members build copies of themselves, nicknamed Gangers. A second wave of the solar storm hits, knocking out the crew and bringing the Gangers to life and creating a potential conflict between the two sides. **At this point, if I see one more shot of that woman watching Amy and see the Doctor looking worriedly at the read-out screen saying she may or may not be pregnant, I may scream. It's beginning to feel like Moffat is treading water on this one. I have a feeling we'll get some answers in episode seven in two weeks and hopefully it will be worth the wait. ***I called the cliffhanger the first time the Doctor touched the large vat of goopy flesh, figuring somehow we'd get a Doctor duplicate running around. Meanwhile, we continued a trend of the Doctor being separated from the TARDIS. Maybe it's an homage to the early days of the show when a lot of the conflict of the stories came from the TARDIS crew not being able to get back to the ship. Or maybe it's my fascination with the classic series and a recent visit back the first Doctor era that's making it seem more apparent than it really is. In the end, the story wasn't exactly thrilling, but it wasn't exactly terrible. It was just sort of there. I didn't love it or hate it. And most damning, I'm not all that hooked to see where it all goes next week. Hopefully the second half can redeem the story. Years ago, a genre magazine published a list of the top ten sci-fi and fantasy TV episodes of all-time. 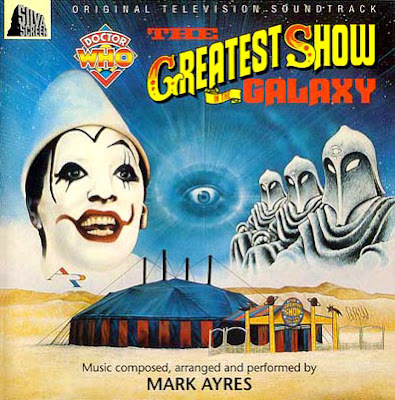 The list included entries from Star Trek, The Twilight Zone and other big names in the universe of genre television. Coming in at number seven was Doctor Who and the Douglas Adams penned story, "City of Death." All I could do was groan to myself. The thing is that while I enjoy "City of Death" it's not necessarily the story I'd choose to represent the epitome of Doctor Who. A lot of times, I think fans get so caught up in the fact that it's written by Adams and has a lot of great one-liners, that they overlook that just having great one liners and a witty script doesn't a good story make. The other thing I feel makes the story's value more inflated in the minds of fans is that it comes in the midst of season 17, a season that has a polarizing effect on the fandom. Some love it, some don't like it. Overall the stories aren't much to write home about, so when you drop something that's above average like "City of Death" in there, it seems a lot better than it really is. Take this story and drop it into the Hinchcliffe era and it's be a middle of the pack story for the season. I'm also fascinated by fans who say that "City of Death" is a really good place to introduce fans to the classic series. I guess it's the combination of Adams, filming in Paris and Tom Baker that makes them think this. But the problem is if your new initiate ends up loving "City of Death" then you're stuck. Why? Because they're nothing else in the Doctor Who canon quite like it. It's a unique little gem in there but it's not going to give a new fan a real taste of what this show is really like or about. It's not a bad story. But it's not a great one either. I don't understand the lavish accolades heaped upon the story over the years. I've tried to see it (I've been trying for 20 plus years now) and I guess it just isn't ever going to be a classic for me. When I first discovered Doctor Who many, many years ago, I stumbled across a record at my local library called Doctor Who: The Music. I quickly checked it out, took it home and began listening to it over and over again. I dubbed it off onto cassette and probably wore the poor thing out of the years. The interesting thing was that I'd seen very little Doctor Who at this point, so this collection of music from the last Tom Baker season and the first Peter Davison season was all fresh to me. I recall envisioning sequences in my head in which the music might be used and then being pleasantly surprised when I finally saw the stories and heard how the music off the record was incorporated into the stories. Eventually, the album was released onto CD with some other musical tracks and it's part of my collection today. I have fond memories of that album and the incidental music on it. But it's only one snapshot of the overall musical legacy of Doctor Who. I'd be remiss if I didn't point out the solid work done by Dudley Simpson for years on the show. And while I like most of it, there's one particular soundtrack that really stands out in my mind. *It should have been on DVD before now, but that's just me. Hopefully when it does come out, it will a great special edition worthy of the long wait. Classic Doctor Who is built around cliffhangers. The average story has at least three, meaning there's a lot to choose from when it comes to the top cliffhanger of all time. That doesn't mean all the cliffhangers are necessarily great. Some of them are forced into an episode for the sake of having one. Some don't work that well and many of them lose their impact because of how the Doctor or whoever is in peril gets out of the situation. But over the years, there have been a fair number that really worked at the moment and within the story itself, some that just stood out, some that left me eager for the next installment of the story. And choosing just one was difficult. Would it be the cliffhanger from part two of "The Aztecs" as Barbara slowly walks up to the fallen Ian where her claims of being a goddess could be disprove and place the TARDIS crew in peril? Or how about the iconic cliffhanger from the first Dalek's story? Or what about that memorable one from "The Caves of Androzani" with the Doctor and Peri facing a firing squad and there being almost no means of escape, only to see the stinger come in as the guns open fire on them? Or how about the one from "Pyramids of Mars, Part 1" where the servant of Sutekh promises Sutkeh's gift of death to all humanity? And how could I forget the cliffhanger to the first part of "Remembrance of the Daleks" when a Dalek went up the stairs for the first time?!? All of those are good...but if there's one cliffhanger that still gives me chills, still thrills me and still just gets under my skin no matter how many times I watch the story, it's the cliffhanger to part three of "The Curse of Fenric." The Doctor has spent three episodes trying to keep the evil Fenric from being released and as part three ends, all hell is breaking lose. As the Doctor races back to try and stop the release of this evil force, he arrives to find it's too late. The story misdirects us for a moment, thinking that Fenric is inhabiting one character while it's taken over another. And slowly, we see the evil force rise behind the Doctor and utter the line, "We play the contest again, Time Lord." As I said a couple of days ago, I devoured the Target novelizations during my formative years as a Doctor Who fan. I had quite an extensive collection and I'm sure my poor English teachers rolled their eyes a lot when they saw me pull them out to read them. (I never did book reports on them or used them for class assignments). For the most part, the Target novels were pretty good. Some were a lot better written than others. The real shame of the Tom Baker era is that it was so popular that the novelizations were rushed much faster, allowing little more than the opportunity to translate the script to the printed page. There wasn't the developing the story, characters and bringing in other subplots that other Doctor's eras received. It's interesting now to hear the stories re-released as audio books. It's a fun trip down memory lane and they're great for running. I know the story well enough that if I miss a detail, I won't be too lost or left out. They're a great distraction. But I'm really avoiding the main point of this post...and for a reason. I can't decide which is my favorite. A few days ago, I talked about how I was glued to "Day of the Daleks" when I first read it. It's still one of those novelizations that is better than the transmitted story in many ways. It could easily be a favorite for the nostalgia factor. But that would overlook two gems from the later stages of the range, "The Curse of Fenric" and "Remembrance of the Daleks." It helps that these are two of my favorite stories and that the novels really enhance the transmitted stories. It also helps that they feature my favorite Doctor. So, I guess you could say I've got three...and those three are it. But overall the Target range was pretty solid and I have a lot of fond memories of it. I'm combining a couple of days worth of posts here simply because while I love Doctor Who, I haven't followed it as closely in every single permutation or tie-in available. That's true of the comics and short stories. I've read a few over the years and while I can recall moments from some, it's not always as clearly defined as say my favorite story or Doctor. So, here we go...three in one! Favorite short story: Don't have one. On paper, the combination of Doctor Who and Neil Gaiman looks like a winner. And while many fans were looking forward to the season premiere of series six, I'd be willing more than a few were equally or more excited to finally see the story from writer Neil Gaiman finally hit our screens this year. It's been rumored for six years now. And while we heard positive buzz on the story from the production team, cast and crew, I'll have to admit that as we counted down the hours until "The Doctor's Wife" finally aired, I was a mix of excitement and worry. Excited that I'd finally get to see it. Worried that my expectations would be so high that no episode could ever live up to them. Those worries evaporated within the first three minutes of this magical episode and for the rest of the story I was swept up in what is one of the best episodes not only of the new series run but also the entire tenure of this long-running series. This one is making a serious run at my top ten of all time* Doctor Who stories based on my initial viewing. After receiving a hyercube message while in deep space, the Doctor takes the TARDIS outside our normal universe and lands on what appears to be an alien junkyard. The Doctor discovers the planet a large creature named House who lured in Time Lords to feed on them and energy from their TARDISes. Also living on this world are a trio of people and an Ood, named Cousin. One of the trio is Idris, who behaves strangely and we eventually discover that House has pulled the personality Matrix from the TARDIS in order to feed on its energy. Upon the discovery that the TARDIS is the last of its kind, House decides to take over the ship and enter our universe to try and find more forms of energy on which to feed. At several points in the history of Doctor Who, people who grew up watching the show and are fans have been given the opportunity to pen a script or two for the series. But none are quite as prominent (at least in fan circles) as Gaiman. Some of the stories penned by fans have been great ("Full Circle") while others went woefully over the line into fan-fiction with too many continuity references and muddle storylines ("Attack of the Cybermen.") Thankfully, "The Doctor's Wife" is from the same school that gave us "Full Circle." Gaiman's story pays homage to the roots of the show as well as examining the fundamental relationship at the heart of the series. Over the years, the one constant piece of the show has been the TARDIS and while certain abilities the time machine may or may not possess have changed from story to story, season to season, it's still been one of the fundamental centers of the show. And yet, we've never really had an episode that really explored the nature of the relationship between the Doctor and his beloved time machine. Gaiman equates the long relationship of these two travelers to that of a marriage and it works beautifully on every level. Lines about how the two chose each other to feel Gallifrey and see the universe were spot-on perfect as was the TARDIS's jealousy over the long line of companions who have traveled over the years. The chemistry between Matt Smith and Suranne Jones as Idris/the TARDIS jumped off the screen. Seeing the two working together to try and build a functional TARDIS console of the bits of destroyed TARDISes on House was delightful. But where Gaiman's script continued to deliver was in not just having the story be merely focused on the relationship of the Doctor and his TARDIS. Just as Rob Sherman did with "Dalek" a threat was created to keep the story momentum. In this case, it's Amy and Rory trapped inside House as the TARDIS, participating in the Doctor Who Olympic sport of corridor running. Seeing House's games he played with the two to try and keep them from reaching their ultimate goal and deciding whether or not to keep them alive kept the story moving and on the edge of your seat. It's one of those cases were the script gets every big thing and every little thing absolutely right and you end up with a story that is, in my mind, an instant classic. It took six years for Neil Gaiman's first Doctor Who script to see our screens. Hopefully if he's got another idea half as good as this one, we won't have to wait six more years to see it. Yesterday's choice of my favorite novel was a difficult one. Today's not as much. As I said, I read all of the NA's and most of the MAs during the time they were published. And I enjoyed most of them. But I will admit there were a few I didn't like. The leader in that field, by far was "The Pit." It had the double whammy of coming after a solid string of NAs and also not being all that interesting or entertaining. Part of my lack of love for it was I took it to a doctor's appointment and was stuck with it in the waiting room. So not only was it not doing it for me, I was also stuck reading it because I had little other choice. One of the funniest moments from Rick and Bubba ever happened this week. I think it may even top "Willy and Wanda." Recently, the BBC aired a radio program examining the impact of Doctor Who in print on the reading habits of children of that era. The program specifically looked at the Target line of novels that in the era before home release of Doctor Who and UK repeats of early serials, was the only way some fans had of finding out what happened in earlier Doctor Who stories. I read and had an extensive collection of the Target novels in my younger days. And then when the series was put on hiatus for fourteen years, I moved over into the original fiction lines of the New Adventures and the Missing Adventures. And I have to admit, I loved them. I believe I've read the entire line of the New Adventures and a great majority of the Missing Adventures. And while I can't recall specific details of every novel I read, there were a few that stood out. One was "The Dying Days" or as I call it, "The TV Movie Done Right." Lance Parkin tells the elements of the TV movie that worked and crafts a far better story than the TV movie did. Of course, I can see why it'd never work to bring in new fans, but that doesn't mean I still didn't love it. Then there was just about any novel by Paul Cornell from "Human Nature" to "Love and War" to "No Future." I can remember eagerly anticipating a lot of the books and being glued to the pages for "The Also People" and "Legacy." And then, there's "Conundrum." The story takes place in the midst of a five-book arc in which an old adversary has returned. The novels do a nice job of keeping the identity of this old adversary under wraps, all while telling some fascinating, intriguing stories. And while I'm sure a lot of fans will disagree with me and wonder why I didn't pick "The Dying Days" or "Human Nature" (both very good), I'm putting up "Conundrum" as my favorite novel. It's one of those books I picked up at the bookstore one evening and once I cracked the cover, I couldn't put it down. A lot of it's probably nostalgia for how much I enjoyed it at the time and how eager it made for the next books in the series (it's the third of the five books). I loved the book then, though I wonder at times if my nostalgia for it is similar to how fans who grew up watching the older serials felt about those stories looking back. I recall the days of the Doctor Who Magazine letters column where fans would hold up certain stories as the great ones and talk about how Doctor Who had never been that good before and would never be that good again. Of course, it was easy to say since most fans hadn't seen the story or stories in question. But then along came VHS and the stories were released...and the general opinion shifted a bit. Some stories were confirmed as classics, others were re-evaluated. I'm afraid that if I were to go back and re-read "Conundrum" and the entire NA line now, I might re-evaluate things. But until I find the time to do that, I'll count this one as my favorite novel. When I first heard that Big Finish planned to re-create the "lost" season 23, I was intrigued. As a fan of the show during the 18-month hiatus between seasons 22 and 23, I'd always been curious about what was planned for the Doctor and Peri during that time. So maybe my expectations were a big too inflated. Or maybe there's a reason that the two stories we'd all heard so much about being part of the "lost" season for so many years were abandoned with the series came back. Or maybe it's the fact that the two stories I heard were in serious need of some editing. 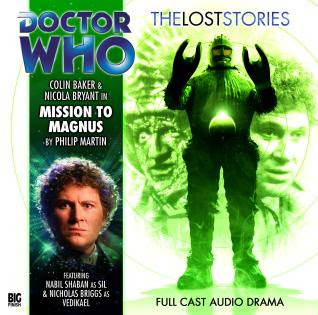 Whatever the reason, I have to say that "Mission to Magnus" just didn't quite do it for me. 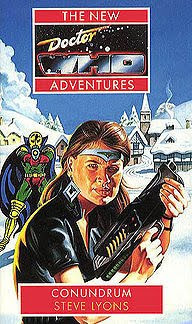 It's a story involving the sixth Doctor and the Ice Warriors. That may be part of the problem. The Ice Warrior voices are a high whispery sound. Put that onto an audio release and it becomes rather problematic. (It's similar to the issue you face translating the Daleks to audio....not exactly the most robust or interesting monsters to listen to long bits of dialogue from). The story feels padded, overlong and is, in general, a mess. And then you've got the return of Sil. He was good in "Vengeance on Varos" and tolerable in "Mindwarp." But the third time isn't the charm and this and "Mindwarp" show that less is more with some characters. I'll have to admit I'm not up to date on all the audio releases out there under the Doctor Who banner. That's because there are simply so many coming out that I'm not sure I have time to listen to them all and do other silly things like earn a living, sleep, eat and watch new episodes of Doctor Who. I've listened to a few over the years. Admittedly, they're hit or miss and not something I generally revisit like I do the television stories. But they can still be an interesting diversion while exercising, working around the house or during a road trip. In fact, my favorite audio comes from a road trip I took years ago. A good friend loaned me her collection of the first "season" of stories with the eight Doctor, Paul McGann to help pass the time. The first couple were good, but it was when I hit "The Chimes of Midnight" that things really kicked up a notch. The story felt like a Doctor Who story, one that clearly understood how to work within the strengths and limitations of the audio story but that could easily have translated into a story for the show should it ever come back. The story was compelling, interesting and it held my interest for its entire run time. Combining two days into one post, simply because I may not have as much to say about the directors category as I do about others. A lot of times, when I debate the merits of Doctor Who stories, a lot of my focus is on who wrote it the story and which producer and/or script editor was behind the scenes. But it's not often that I consider who directed the story. This is partially a bias I have towards writers, but I think it also speaks to the level of direction that the series had for years. The directors had a huge burden, especially in the classic era, of bringing the story to life on-screen, all within the rather limited budget Doctor Who had. The series has wobbly sets and I'm sure the effects were limiting in their way. And while we're quick to credit the actors, writers and producers for the show's long success, the directors have to be part of it as well. As for my least favorite director, I'm not really sure I have one. For some reason, there's not really a director for the show that garners the lack of enthusiasm I get for certain writers and producers. In the overall arc of the sixth series of Doctor Who, "The Curse of the Black Spot" has the poor luck of being sandwiched between two highly anticipated episodes--the two-part season premiere and the Neil Gaiman episode. It's a slot that could easily be on that surprises or delights us as "Blink" did a few years ago. Instead "Black Spot" wasn't necessarily terrible, but it wasn't necessarily great. It was just sort of there. Part of the problem is the the first half of the episode really doesn't do much beyond answer the question, "Wouldn't it be cool if the Doctor was on a pirate ship?" Once we establish that we're on a pirate ship that's not moving and that there's some threat to crew if you injure yourself, the story is content to throw out a series of red herrings in an attempt to keep the Doctor from deducing too quickly what exactly is going on here. If the two part season premiere felt like it was taking some of Moffat's favorite themes and throwing them into a blender, "Black Spot" upped that feeling of "been there, done that" by giving us an almost laundry list of greatest hits from the new series run and Moffat's tenure as producer. * Not necessarily a bad thing, mind you but after the show significantly upped the ante last week, it felt like this straight-forward a story was a step sideways instead of a step forward. * It also doesn't help that large chunks of "Black Spot" feel like they're lifted from the Jon Pertwee four-part story "Carnival of Monsters" including the TARDIS materializing on a ship inside of something else and the crew being observed. In both stories, a force outside the ship removes the TARDIS from the ship to the outside universe. It's also a bit of reminder that the series is designed for children because while the adult side of me was picking things apart and seeing a greatest hits medley, there's a part of me that knows if I'd seen the story when I was twelve, I'd have been delighted by the episode. The Doctor, Amy and Rory having swashbuckling adventures on a pirate ship is just one of those kinds of stories that screams out for kids to enjoy reliving on the playground all week as we build up to the next installment. Atmospherically the story worked and the series continues to be visually beautiful to behold. It's fascinating to see how Moffat juggles the budget each year to have big ticket items like a trip to America, complete with scenic vistas in Monument Valley the past two weeks but still manages to create the worlds we see here--both the pirate ship and the alien space craft we see in the final half of the story. And I don't fault any of the acting work here. Stephen Thompson as the pirate captain is solid enough and Lily Cole as the mermaid/holographic healing program isn't asked to do much besides look pretty and be threatening. Of the two, Thompson is the stronger with what he's given but there wasn't really a lot here to work with. But in the end, it felt more like this one is a catch your breath episode between last week and next week. And maybe the calm of the sea as seen in the storyline here is meant to foreshadow that this is the calm before the storm for the rest of series six (well, at least the first half, anyway). Just as yesterday's category generated an instant response, so does today's category. Who are my least favorite writers in Doctor Who history? If you notice the plural and you're a classic series fan you can probably guess what's coming. It would have to be Pip and Jane Baker. The writing team contributed three and a half scripts to the classic series run and most of them are better forgotten. Part of it could be that they wrote during a time when the behind-the-scenes events of the show were almost more interesting than what we saw on screen. And maybe if they'd stopped writing with "Terror of the Vervoids" and part two of "The Ultimate Foe," I might have been more willing to forgive and forget. But then we got "Time and the Rani," a story that fails on just about every level. It's not my least favorite story, but it's definitely bottom five and one of the least auspicious debuts for a new Doctor ever written. How much of this is the Bakers' fault, I'm not sure...but their name is on it so I give them a large part of the blame. Poll ten classic Doctor Who fans about their favorite writer and odds are you're going to get the same response time after time--Robert Holmes. We may disagree on which Doctor we like best, which story is the best and which era of the show is the best, but the one thing most classic series fans agree on is that when it came to Doctor Who, no one did it better than Robert Holmes. Nor was there another writer who offered quality scripts over a longer period of time for the show's run than Holmes did. Holmes contributed a script a season for four of the five Pertwee seasons and then took over as script editor when Tom Baker came on the scene. Holmes either wrote or heavily rewrote every script the show produced for the next three years. Even the biggest clunker of that era ("The Android Invasion") still has at least something to recommend about it. Holmes didn't end his association when he left his script editing duties. He offered a few other scripts, some good, a couple of great and then one that was sadly a rough draft for what many consider his finest achievement several years later. I deny you to watch "Power of Kroll" and not see elements of "Caves of Androzani" lurking in there. Holmes was respected enough that he was the first choice of the production team to write the 20th anniversary story. It didn't happen because Holmes didn't feel he could fit in all the pieces John-Nathan Turner wanted. And while I enjoy "The Five Doctors" I still can't help but wonder what might have been with the 20th anniversary story from Holmes. But it all set up his crowning achievement, "Caves of Androzani." Holmes would write a couple of more scripts before his untimely death and while they weren't great they still had a lot to recommend about them. (I still say episode one of "The Two Doctors" is the best single episode of Colin Baker's era). With modern Who, only Steven Moffat has come close to being in the league that Holmes was--not just for good stories but consistency over time. But Moffat will still have to work long and hard to be as well love as Holmes is. Given how good the BBC is at historical drama, it's pretty much a no-brainer that they'd be good at creating historical stories for Doctor Who. Let's not forget the original intent of Doctor Who was to teach younger viewers about history. That intention just got a bit sidetracked five weeks into the series run with the Daleks proved to be a pretty big deal. But it was the historical stories that were the bread and butter for the show early on it is run. Outside of the Daleks, there weren't a lot of other really memorable early adversaries or monsters for the TARDIS crews to face. But there were a handful of historical stories that were superbly realized and fairly well executed. I've never seen all seven episodes of "Marco Polo" though from what I hear it was fantastic. I've listened to the narrated soundtrack of the story and found it a compelling and fascinating story. I just wish we had the visuals to go along with it. They're recreated it as much as they can on the DVD set "The Beginnings" but it's just not the same as seeing all seven episodes in their original black and white glory. That leaves the second historical story, "The Aztecs" as my favorite historical story. The TARDIS crew travels back in time to visit the kingdom of the Aztecs. Barbara is mistaken for an Aztec god and the chief of sacrifice, Tlotoxl is threatened by her arrival on the scene and sets out to prove she isn't who she says she is. That's because Barbara has decided she'll change the course of history by ending the Aztec's practice of human sacrifice. Despite warnings from the Doctor that she can't change history like that, Barbara plows forward and learns a hard lesson. In a lot of ways, "The Aztecs" has all the components of a typical early William Harntell story. Most of the conflict comes from the fact that the TARDIS crew is cut off from the ship and must find a way to get back to it before time runs out. In this case, the ship is sealed into the tomb of the god Barbara is impersonating (she is mistaken for him when she puts on a bracelet found inside the tomb). And while a lot of the early cliches of the show are on display, they're presented in such an entertaining way that you don't mind. The conflict between the Doctor and Barbara is exactly right and is what elevates the story to classic status. That plus the fact that Ttotoxl chews the scenery well and is a genuine threat to the TARDIS crew and their safety. Watching as he manipulates events to help his cause is compelling and fascinating. 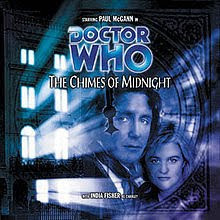 Add in that it features one of my favorite cliffhangers from the Harntell era (episode two) and you've got not just a great historical story but one of the best Doctor Who stories ever produced. During the 80s, producer John Nathan Turner was great at coming up with ideas to promote Doctor Who. One of his ideas was to take the show on location to other countries and shoot parts of various stories. Good idea, but the results are a bit mixed. The original idea of taking "The Two Doctors" to American and New Orleans to film had to be punted when some of the American financing fell through. And the use of Amsterdam for some of the Earth-bound segments of "Arc of Infinity" seemed like a good idea on paper (and possibly to JNT for a company-paid-for vacation), it didn't quite translate as well in the finished product. It'd be tempting to say the recently aired two-part opening to series six was my favorite, if only for the sweeping shots of Utah's Monument Valley. (I've got to visit someday just to see the vistas where Doctor Who filmed as well as some of my favorite movies of all time, especially The Searchers). And while "The Impossible Astronaut" and "Day of the Moon" are still fresh, they aren't instant classics in my mind. But the visual work done on the location shooting is enough for me to put name them as my favorite "foreign" story, for now. I will admit "Planet of Fire" was in the running for a bit, but the scenes filmed at the volcano amount to little more than standard "let's create an alien world in a quarry" filming for the UK-filmed stories. When I first discovered Doctor Who, my local PBS station was in the middle of two longer eras that didn't feature an appearance by the Doctor's greatest enemies, the Daleks. My entry into to the Tom Baker years missed "Genesis of the Daleks" by two weeks and and I was in the middle of the Davison years and "Revelation of the Daleks" was still a good bit off. So, my first exposure to the Doctor's greatest enemies came on the pages of a novelization--in this case "Day of the Daleks" by Terrance Dicks. This Pertwee-era story was a bit confusing to me at the time. Being new to the show, I wondered at what point Jo Grant would travel with the fourth Doctor. (I was young and there was no Internet in those days. And I had yet to discover "The Programme Guide" at my local bookstore). If you were an American fan during this era, you may recall the Pinnacle published series. Basically it was a reprint of the Target novel with a different cover and an introduction by Harlan Ellison (in which he proclaimed Doctor Who the greatest sci-fi TV show ever made). I recall being glued to this novelization. It's one of the early entries from the line and Terrance Dicks was given time to expand the story. So much so that I was eventually disappointed when I finally saw it because it didn't live up to the image I'd created in my mind for the story. And it was there I was hooked on the Daleks and couldn't wait to see them. I eventually did and I loved them. So much so that when I met Sylvester McCoy years later, my burning question was had he met the Daleks yet. At the time, he hadn't, but he said he'd head back to the BBC and ask them to put a story into development since the American fans were demanding it. Weeks later, I heard "Remembrance of the Daleks" was headed our way for season 25...and some part of me imagined McCoy had gone back and asked for it to me made just for me. I'll admit it--I'm a sucker for the Daleks. But I like it when they're used well in a story. And while they cast a giant shadow across all other monsters in Who history, there are a handful of stories that show us why they're so memorable. They look truly alien and they have a fascinating history--both on-screen and behind the scenes. It's also best when you try to ponder their chronology to not really think about it too much. There are gaping holes in it and things done because no one ever thought the series would be repeated at any point, much less scrutinized the detail that fans do today. But good or bad, I still get a bit of a twinge of excitement when I hear the Daleks are coming back for an episode. They're still my favorite monster and probably always will be. A superb creation and the thing that helped put the show on the map and catapulted Doctor Who to its long run. If not for the Daleks, Doctor Who would be this 13-week show that ran in 1963 and was forgotten.